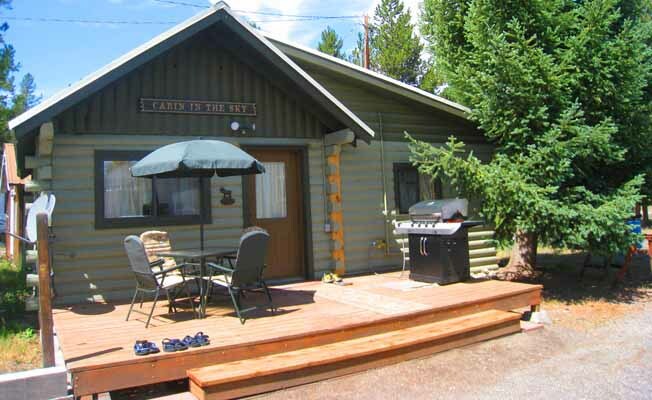 Cabin in the Sky is a cozy, fun completely remodeled two bedroom cabin, perfect for a small family! All new furnishings, clean, pleasant and quiet with plenty of off street parking. The bedrooms are adjoining with a queen bed in the front bedroom and a full and twin bed in the back bedroom. There is a sectional sofa with a full pull out sleeper in the living area. It's perfect for 4 adults or a family of 5 to 7. The cabin has a complete kitchen, stove, microwave, refrigerator (sorry no dishwasher except your hands!! But paper goods are provided!) All cooking and serving utensils, dishes and linens are provided. Dine inside at the breakfast bars or enjoy the front deck equipped with a full size natural gas barbecue and outdoor dining area. There is a full bathroom with a bathtub and shower. After a beautiful day in our mountains, relax and catch a movie on one of two flat screen TVs or enjoy a mix of fun music. There is a selection of DVDs and CDs provided, as well as children's games and books. Bring your IPOD and plug it in to the stereo. If you have a large group the Cabin is on the same property as Blue Cloud House (5 bedrooms). Reserve them both for a great group get-away! !